The XXVII Grande Prêmio Marlboro do Brasil was the second race on the calender in the 1998 Formula One Season. The race saw another convincing win for Mika Häkkinen and the McLaren-Mercedes team. Despite the political controversy that surrounded the team throughout the weekend which saw that the extra brake pedal used by the team was deemed to be illegal by the FIA, the McLaren team were still able to demonstrate significant pace and took their second one-two victory of the season. Following the first round of the championship in Australia, the McLaren-Mercedes team was shrouded in controversy. The team were heavily critcised for race fixing when David Coulthard allowed teammate Mika Häkkinen through to take the lead and race victory due to a pre-race agreement. McLaren team principal Ron Dennis conceded that the result was not ideal yet emphasised that the McLaren driver's raced for the success of the team rather than their own personal fortunes, Dennis also admitted that the same agreement would be upheld in Brazil despite the controversy surrounding the decision. Furthermore the Ferrari team believed that the second brake pedal that was being used by the McLaren was infact illegal due to it contributing to four wheel steering and traction control, devices banned from Formula One at the time. Ferrari also suggested such a system was dangerous. Both Sauber and Minardi lodged the same protest in support of Ferrari. Tyrrell lodged a similar protest to McLaren whilst Arrows lodged protests to not only McLaren but also to Williams and Jordan who had used similar devices in Australia. Prost was the only team to remain imparital in the debate. Ron Dennis remained adamant that the device was legal and believed those that challenged the legality of the device were 'seriously mistaken'. The investigation took place shortly before the Friday practice session, the FIA deemed that the devices used by McLaren, Williams and Jordan were illegal and required the three team's to disable the devices before the first practice session. As well as this the FIA censored Ferrari, Sauber and Minardi for suggesting the devices were dangerous. Although it was annouced shortly before the morning practice session on Friday that the braking devices used by McLaren, Williams and Jordan were illegal, this did not seem to hamper the dominance of the McLaren's during the first practice session. Häkkinen and Coulthard lapped nearly a second quicker than the rest of the field, the duo ran on nearly a single set of Bridgestone tyres throughout the day before running fresh rubber at the end of the session in the afternoon to set some blistering lap times. Ralf Schumacher ran well for Jordan ending up third fastest, believing Jordan to be "much more competitive" following a successful test session in Barcelona. Teammate Damon Hill struggled with gear-selection problems and finished the day in twelfth. Olivier Panis also impressed for Prost setting the fourth fastest time whilst teammate Jarno Trulli suffered electrical problems meaning only a fifteenth position on the timesheets. Eddie Irvine led Ferrari with a fifth placing, running on two sets of tyres in the session. Teammate Michael Schumacher only ran on a single set of tyres throughout the day which saw him finish in only eleventh position. Whilst Alexander Wurz set the sixth fastest time in his Benetton, his session was cut short when he spun off the circuit and into the gravel trap during the afternoon runs. Teammate Giancarlo Fisichella had his own issues suffering from hydraulic issues throughout the day. Williams placed in seventh and ninth with Heinz-Harald Frentzen leading Jacques Villeneuve. The team concentrated on heavy fuel loads and longer runs. Rubens Barrichello ran well to put his Stewart into eighth position. Teammate Jan Magnussen clipped the wall towards the end of the session and spun out into the gravel trap. As qualifying began both Jacques Villeneuve and Johnny Herbert would be starting in their spare cars due to their race cars being damaged in their accidents during the Saturday practice session. Herbert's throttle had stuck wide open. There was also the threat that Mika Häkkinen, Eddie Irvine, Damon Hill, Alexander Wurz, Olivier Panis and Pedro Diniz would participate in qualifying with the threat of getting their fastest time taken away for failing to slow down for yellow flags in the morning practice session. After the morning practice session, both Häkkinen and Coulthard had lapped 1.2 seconds faster than their nearest competitor, the Williams of Heinz-Harald Frentzen. Häkkinen had been only a tenth of a second faster than teammate Coulthard, suggesting a tight battle for the qualifying period. Murray Walker pointing out that "their braking system contributed something, but not as much as everyone expected." The air temperature at Interlagos was sitting at 30° whilst the track temperature had risen to 40°. The Bridgestone runners, particularly McLaren and Benetton were looking quick at Interlagos. Whilst leading the Goodyear runners, Michael Schumacher being described by Martin Brundle as being "driving the wheels off that Ferrari as ever is also there, or there abouts." Brundle would cite the infield section as the most critical part of the circuit, noting "this is where all the time is, this is where Häkkinen was quicker than Coulthard this morning and this is where your whole qualifying lap is made or lost. The other parts are more spectacular, more fun to drive but you spend a lot more relative time in the slow corners, in the first and second gear corners and you can win so much getting off the brake pedal 3-4 metres earlier and getting on the throttle pedal gently and firmly." Ahead of qualifying, Coulthard was apprehensive in being able to beat his teammate, noting to Martin Brundle "I'm going to struggle to beat Mika to pole today". However Coulthard would have an advantage in the fact that Häkkinen's fastest time would likely be deleted. Jarno Trulli in the Prost was the first car out on track, he notably botched his first flying lap when he ran wide at the Pinheirinho. Brundle commenting "he ran wide there, didn't get the car onto the kerbs at the right hander, that will have cost him badly, and Trulli he had a poor run through the Melbourne weekend, he needs a strong performance this weekend and this lap is not going to work to well for him." Shortly afterwards Ralf Schumacher in the Jordan however after he had set his first lap time, Ricardo Rosset in the Tyrrell spun his car and stalled going into the S do Senna on his first flying lap. The marshalls being forced to bring out the double yellow flags. Rosset was able to find neutral and pull his car off to the side of the circuit, before running back to the pits for the spare car. Murray Walker commenting, "he's been in real trouble, the Brazilian, he went off on the out-lap yesterday and took the right hand side off the Tyrrell. He had a problem this morning and look at him here, the one place he would have wanted to do better than anywhere else is Interlagos, he comes from São Paulo and he has gone off at the Senna 'S' of all places in front of thousands of his countrymen." Martin Brundle further added, "there are some days that Rosset looks like he couldn't drive a nail into a piece of wood and this looks like one of them". David Coulthard's McLaren was the first of the front runners to go out on track where he would attempt to get the early advantage over teammate Häkkinen. Brundle noting through the infield section "Häkkinen has had 2-3 tenths on him. I know David's been looking at the line, looking at the computer traces and trying to understand just how Häkkinen gets on the throttle that little bit earlier than him. Then through the Mergulho and Juncao, David is taking time back from Häkkinen, that's why there has been a tenth between them"
Coulthard immediately was on the backfoot, locking the front left wheels in the approach to the S do Senna and ran wide into the corner. He then struggled with the back end through Pinheirinho, his run being described as a "terrible lap" by Martin Brundle. Nonetheless despite his problems, Coulthard ran a full second fastest than the best time set by Panis's Prost with a 1:18.769. Brundle observing "the track is very, very slippery. He is still attacking the in-lap to see if he can find out where the new level of grip is. But he was really fighting that car. It is often a shock, its been two hours since the morning session, the track temperature goes up and brake down vehicles, all kinds of vehicles take to the race track, dust gets spread around and suddenly you appear to have a different car on a different track. And where the car was good two hours ago, you are fighting it. And David has to learn where the new level of grip is because that first lap of his had way too many mistakes." With the first quarter of qualifying completed, Coulthard led Panis, Hill, Alesi, R Schumacher and Trulli. As Herbert approached the S do Senna, like Coulthard before him, he had a severe lock-up through the corner. Brundle had described him as having "a weekend from hell". Herbert was clearly struggling, through the Pinheirinho, the Sauber was at full opposite lock. Martin Brundle joking "Colin McRae would have been happy with that recovery, with full opposite lock." Thereafter the new order read, Coulthard ahead of Irvine, Panis, Hill, Alesi, R Schumacher, Trulli, Nakano and Herbert. Coulthard's fastest time was usurped by Wurz's Benetton, however his time at the top was brief as Häkkinen quickly took the pole time with a 1:17.288. The second Benetton of Fisichella and Schumacher's Ferrari would further bump Coulthard down to fifth position. There would be further drama, when Villeneuve spoiled his first flying lap when he spun his Williams at the Mergulho. Shortly afterwards the Arrows of Pedro Diniz went off into the gravel at Ferradura, Diniz managed to keep the engine running and get back onto the circuit. At this time Coulthard who had dropped to sixth after his poor first flying lap had come out of the pits for a second run, he was behind Häkkinen, Wurz, Fisichella, Ralf Schumacher and Michael Schumacher. On Ralf Schumacher, Brundle commented "Damon will be watching this closely, he was out qualified by Ralf in Melbourne, and certainly won't want to be out qualified again here. He doesn't need Ralf to be faster than him, its very bad for his reputation and Ralf does appear to like this track". In response, Hill could only improve his own time to go ninth fastest. Martin Brundle commenting "Still nine tenths slower than Ralf, because Ralf clearly has either a quicker style or more likely, a quicker set-up." The new order read Häkkinen ahead of Wurz, Fisichella, R Schumacher, M Schumacher, Coulthard, Frentzen, Trulli, Hill, Barrichello, Irvine, Panis, Villeneuve, Alesi, Tuero, Nakano, Rosset, Magnussen, Herbert, Salo, Takagi and Diniz. Re-entering the track were the two McLaren's of Häkkinen and Coulthard as well as Schumacher's Ferrari and Frentzen's Williams. Frentzen was described to have "a pathetic lap" by Brundle, the Williams driver consistently locking up throughout his lap. However despite this, Frentzen made a significant improvement to go third fastest. Häkkinen then bettered his time once again to a 1:17.092 setting down a new benchmark for his rivals. Coulthard improved his time to a 1:17.757 but was still quite off the pace to his McLaren teammate. Shortly after Schumacher's Ferrari moved up into third position. Fisichella then had a large spin, losing control of his Benetton at the Mergulho and spinning into the gravel trap. The double waved yellows were brought out as the marshalls cleared the stricken Benetton, Fisichella, meanwhile would be forced to run back to the pits on foot. More amusingly, Louise Goodman reported "There is loads of action happening out on track, Jarno Trulli isn't taking in any part of it. He's been in the garage for quite some time whilst the mechanics make some changes to the car. He's been there so long, he has actually nodded off in the car. The mechanics have had to wake him up to ask him a question." Herbert in the Sauber who had been having a nightmare of a weekend, made an excellent improvement to put his car up into tenth position. Brundle commenting "that's the new mature Johnny Herbert, he's doing a fantastic job, really got hold of that Sauber team. He's really not got a clear lap in all weekend and here he is, two tenths ahead of his teammate Alesi." Coulthard, the only man who could seemingly challenge Häkkinen failed to improve on his time on his third run, going one tenth slower than his previous lap. The Minardi of Esteban Tuero ground to a halt along the start finish straight, forcing Häkkinen to abandon one of his lap times. Alexander Wurz also suffered a mechanical failure whilst coming into the pits forcing his Benetton mechanics to push his car down the pit-lane. With three minutes to go Heinz-Harald Frentzen in the Williams moved up into third position with a 1:18.109, one tenth of a second faster than Schumacher. In the dying seconds of the session Schumacher attempted to regain the position but his laptime was not quick enough to displace Frentzen. Häkkinen therefore took pole ahead of Coulthard, Frentzen, Schumacher, Wurz and Irvine. The driver's under investigation for speeding under yellow flags in practice saw no penalty applied to them. At the start, Häkkinen made the perfect start pulling away from Coulthard and Frentzen. Michael Schumacher made a poor start dropping behind teammate Eddie Irvine and Alexander Wurz's Benetton. Jacques Villeneuve made a strong start climbing up to seventh from tenth. Rubens Barrichello in his home grand prix climbed from thirteenth to ninth in his Stewart at the start. Ralf Schumacher ended his afternoon when he spun his Jordan into the gravel trap going into turn 4. Going into turn 14, Michael Schumacher was able to reclaim fifth from Wurz at the end of the first lap. The McLaren's immediately began to pull away from the rest of the field after the first lap. The two Ferrari's of Schumacher and Irvine began a duel for fourth position whilst on the third lap, the Tyrrell of Toranosuke Takagi and the Minardi of Shinji Nakano collided going into the first corner. Nakano spun out and stalled being sent out of the race. On lap 10 Irvine let Schumacher through under team orders, Schumacher then soon began to put pressure on the Williams of Heinz-Harald Frentzen for third. Further down the second Williams of Jacques Villeneuve began to put pressure on Alexander Wurz for sixth position. Lap 13 saw Johnny Herbert overtake the Prost of Jarno Trulli for eleventh position. On lap 17 Trulli pulled into the pits and retirement with a fuel pump issue. The same lap Häkkinen and Coulthard began lapping the first of the backmarkers. Mika Salo's Arrows pulled off the circuit with engine troubles as the McLaren's came around to lap him. One lap later Takagi's Tyrrell suffered a large engine failure sending him out of the race. By lap 20, Häkkinen led by 6 seconds over Coulthard, whilst Coulthard held a 17 second lead over the duelling pair of Frentzen and Schumacher. The McLaren's once again demonstrating a dominance over the rest of the field. On lap 23, Schumacher came into the pits for his first stop being stationary for 8.5 seconds before re-entering the track in eighth position. One lap later Frentzen and Irvine came into the pits, Frentzen was held up by the traffic of backmarkers during his in-lap which allowed Schumacher to get ahead of the Williams following the pit-stops. Both Schumacher and Frentzen were stuck behind the Benetton of Giancarlo Fisichella who had yet to stop. Irvine was unlucky to exit behind a lot of traffic, seemingly ruining his afternoon. Schumacher quickly disposed of Fisichella whilst a few corners later, Fisichella ran very wide going into turn 8 allowing Frentzen through. Diniz retired his Arrows with gearbox trouble. On the same lap Villeneuve pitted his Williams from fourth position, suffering a very slow pit-stop of 9.3 seconds exiting in twelfth. The McLaren's continued to dominate out front, the rest of the field seemingly two stopping whilst the McLaren's maintaining a one-stop strategy. On lap 30, Irvine managed to overtake the Prost of Olivier Panis for tenth. He then began to engage in a duel with the Sauber of Jean Alesi for ninth. By lap 35 the other Ferrari of Schumacher began to bare down on Wurz's Benetton who had yet to make his first pit-stop. On lap 36, Coulthard became the first McLaren to come into the pits for his one and only stop. He exited the pits remaining in second position. 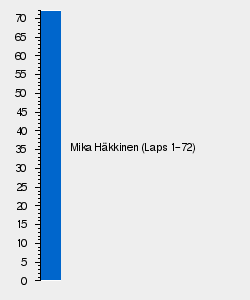 Three laps later Häkkinen took his first pit-stop, he rejoined the race in a comfortable lead. The same lap Jacques Villeneuve overtook the Prost of Panis for ninth and caught up to Alesi and Irvine who were duelling for seventh position. One lap later Villeneuve managed to overtake Irvine for eighth at the first corner, a lap later he managed to take Alesi for seventh at the same corner. Among the front runners, Schumacher and Frentzen began putting heavy pressure on Wurz in third who had yet to make a pit-stop. Lap 44 saw Tuero retire from the race with throttle issues. On lap 46 Williams opted to bring Frentzen in, whose speed was being hampered by the slower Schumacher and Wurz in front of him. The following lap Wurz finally made his first stop, dropping down to eight notably behind the Williams of Frentzen. On lap 47 Villeneuve came into the pits for his second pits stop whilst in fourth position. By lap 50, Coulthard notably began catching the leading McLaren of Häkkinen, by lap 52 he had dropped the gap to 4.2 seconds. Ricardo Rosset retired from his home race on lap 52 with gearbox issues. On lap 55, Schumacher came into the pits for his second pit-stop. As he entered the pits he notably stalled in the pits, however the mechanics were quickly able to restart the engine. Schumacher despite a 14 second stop managed to make it just outside the duelling pair of Wurz and Frentzen, Wurz managing to overtake Frentzen into the first corner as Schumacher was coming into the pits. One lap later Rubens Barrichello was running eleventh position at his home race retired with gearbox issues, meaning all the Brazilian drivers were forced into retirement for their home race. Normal position order was restored when Irvine who was in third came into the pits for his second stop dropping back to eighth. Lap 63 saw Panis suffer an engine blowout whilst running in tenth position. Whilst Coulthard had been catching Häkkinen earlier on, Häkkinen managed to successfully manage the gap to his teammate. On lap 67, Johnny Herbert became the last retirement opting to pull out of the race after neck pains following his accident in Saturday practice. Despite running slowly on the final lap allowing Coulthard to close to 1.2 seconds, Häkkinen went on to take the race victory. Schumacher finished in third a full minute behind Coulthard with Wurz, Frentzen and Fisichella taking the final points positions. Damon Hill who had finished the race in tenth position was later disqualified due to his car being under the weight limit after post-race scrutineering.